Attention deficit hyperactivity disorder (ADHD) is a common, complex and highly heritable disorder, characterised by inattentive, impulsive and overactive behaviour. Evidence for the heritability of ADHD measures in twin population samples has come from the analysis of total scores that combine inattentive and hyperactive–impulsive symptoms subscales. 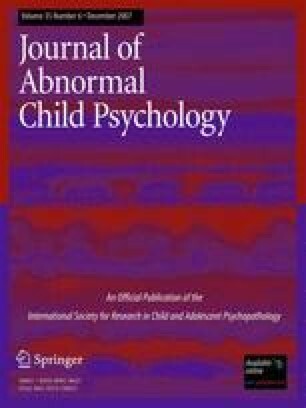 This study investigated, in a community sample, the aetiology of ADHD-like traits and the aetiological overlap between the two dimensions that define the ADHD disorder. Parents of 6,222 approximately 8-year-old twin pairs from the Twins Early Development Study (TEDS) population sample completed the two subscales of the Conners’ 18-item DSMIV checklist, a screening instrument for ADHD symptoms. Both subscales were highly heritable (hyperactive–impulsive: 88%; inattentive: 79%). Bivariate genetic modelling indicated substantial genetic overlap between the two components; however, there were significant independent genetic effects. These findings suggest that many genes associated with the hyperactivity–impulsivity dimension will also be associated with the inattentive dimension but that there is significant genetic heterogeneity as well. These results provide genetic support for combining the two behavioural dimensions that define ADHD, but also suggest that some symptom-specific genes will also be identified. Correspondence and reprint requests to Gráinne McLoughlin, SGDP Centre, Institute of Psychiatry, De Crespigny Park, London SE5 8AF, Tel: +44(0) 207-848-5261; Email: g.mcloughlin@iop.kcl.ac.uk. We are indebted to participants of the Twins Early Development Study (TEDS) for making the study possible. The authors have no financial relationships to disclose. TEDS is funded by MRC grant G0500079. Angelica Ronald is funded by a fellowship from Autism Speaks.